Process versus product is a concept I have struggled with for a while as an artist. Do you paint pretty paintings that sell, or are you true to your own process? Small kids will always be true to their process. 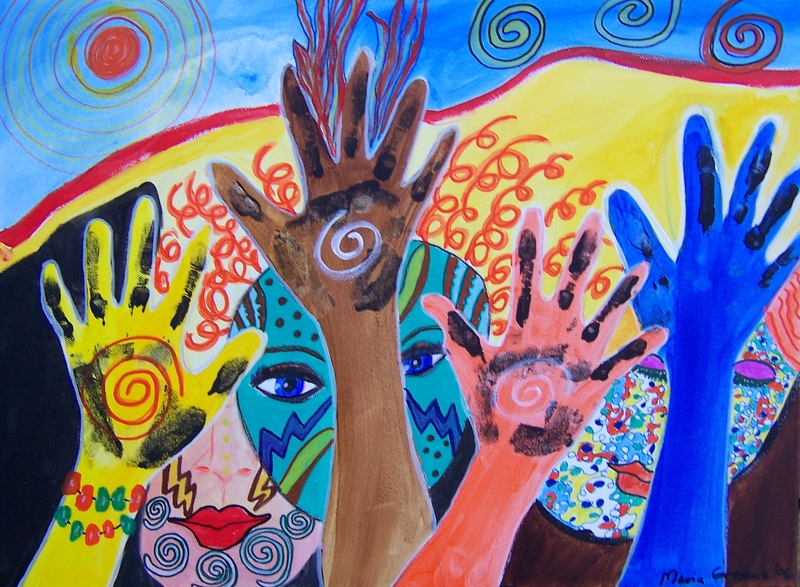 They paint with abandon, and their art is filled with joyous energy. We lose that wild creativity because we start judging the art at some point. According to our preferences, it’s good or bad. There are artists like Jackson Pollock that I don’t particularly admire, but the energy in his dripped art is phenomenal. People pick up on the energy. Art that we would reject without a second glance sell for millions. Artists love making a living from their art; that’s a given. I find myself always judging my own art. Is it salable, or is it junk? We would not judge kids’ art as junk, but maybe some do. I do enjoy making crafts too, but they don’t count in this kind of dilemma. Crafting is a more peaceful, straightforward process and you know the end result. It tends to get tedious in the long run while painting never gets tedious but can be extremely challenging. Sometimes it gets to a point where I don’t want to be challenged, and I paint something pretty. There is nothing wrong with pretty, but I want to paint from my true inner genius. In my years of painting, I was always drawn to intuitive expression, which means standing in front of a blank canvas and just reach for the first color that comes to mind and paint something, whatever I am drawn to paint. The canvas will decide what is to come. It’s a frightening but exciting process to watch the artwork emerge on its own. It’s torture sometimes, but it’s a process I’ve never quite been able to leave. I started painting this way back in the 90s after reading Aviva Gold’s Painting From The Source. Later in this post I will display a list of the books that have influenced my intuitive painting the most. Here are two pictures of old intuitive art I painted in the 90s. I have some huge paintings that are rolled up in my closet, and I can’t bear to throw them away. However, there is no wall space for them where I live. 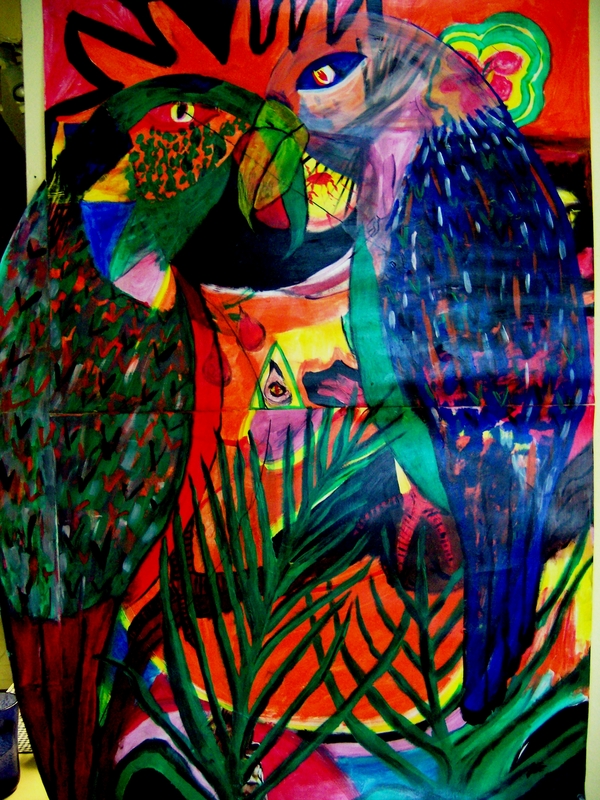 These guys ended up being parrots in the jungle, but I probably started out with a blob of paint in the middle of the poster board. There is a lot of detail underneath the birds, and I believe that all layers add to the finished art. I still paint in many layers. This is a huge, really weird painting, but it had lots of energy. I painted it over an old framed painting, and it sold and was shipped off. Intuitive art is like dreams in many ways. The images are fragmented and don’t seem to make sense, but there is always an underlying message. The subconscious speaks through the art if you ALLOW it. Here is another kind of fun variation of intuitive painting. I ended up painting my own hands all over the art. Art journaling is also a good way to experiment. You know the art is just for you. The pressure of selling it is gone, and you can go crazy on the pages. 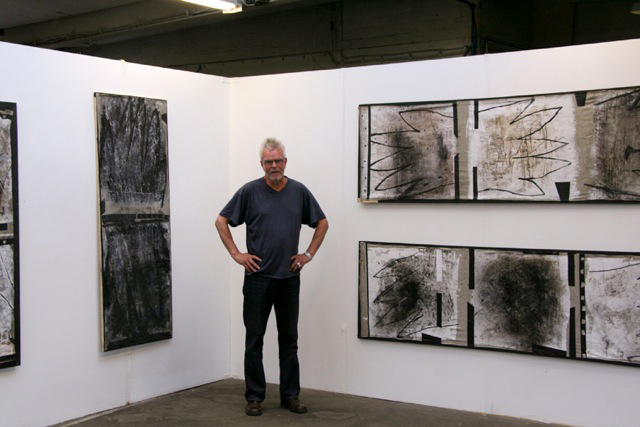 I admire my big brother, Ingvar Staffans, who has painted all of his life. He only uses black, white, brown, and maybe some beige in his art. 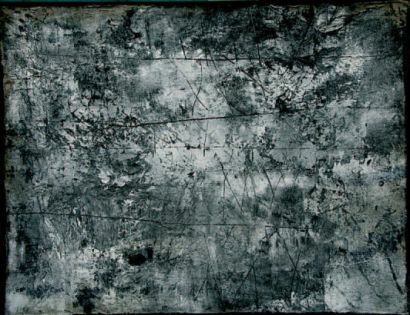 He paints HUGE abstract expressions and have never even tried to paint pretty pictures. He is true to his own art. Some of it I don’t like, but some bowls me over with its amazing energy. He’s not afraid to experiment and I respect that. Hard to believe we’re related, huh? He never read any books on intuitive painting, lol. He is a process man, not a product man. Anyway, here is the list of books that can inspire you to paint intuitively. I particularly recommend Michele Cassou’s books. They will tell what to do when you get stuck. Her process is totally freeing. The book links are to Amazon. Some you can probably find at the library. POINT ZERO by Michele Cassou HERE. 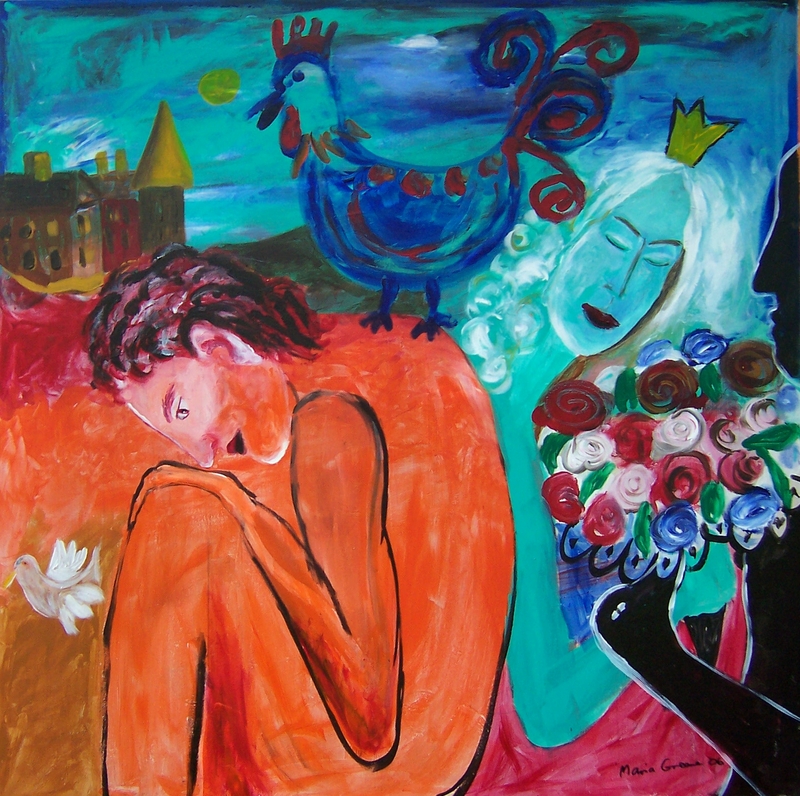 LIFE, PAINT and PASSION by Michele Cassou and Stewart Cubley HERE. PAINTING FROM THE SOURCE by Aviva Gold HERE. A more recent book: PAINT MOJO by Tracy Verdugo HERE. Another book to help open up your creativity is THE TRICKSTER’S HAT by Nick Bantock HERE. And the classic THE ARTIST’S WAY by Julia Cameron HERE. This is not pretty, but meaningful to me. At this point I just want to express myself, not necessarily paint pretty pictures. It is an evolving journey! 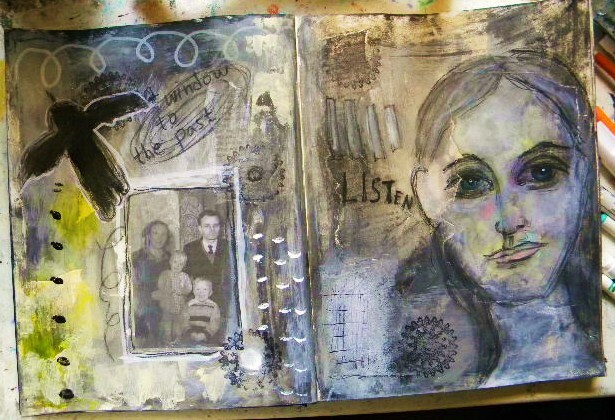 I made a video of this art journal spread, and you can watch it HERE. What are you working on today? It is important … because life happens NOW. P.S. If you’re interested in receiving my newsletter, you can sign up HERE.